Does global increase the incidence of diseases? Warmer temperatures tend to encourage pests to flourish. This includes everything from insects and rodents to viruses and germs. Mosquitoes, which are responsible for killing more human beings than any other animal on the planet because they spread disease through exposure to blood, thrive nicely in hot to temperate climates. Their breeding cycles become shorter, which allows them to reproduce more frequently each year. Mosquitoes spread diseases such as malaria and dengue fever. Rodents, carrying disease-spreading parasites like fleas and ticks, also spread their ranges as climates warm. The problem is multiplied by the fact that along with global warming comes drought, flooding, and famine, which lead to poverty, homelessness, and unsanitary water supplies. All of these encourage unsanitary living conditions that help spread diseases, such as cholera. According to a 2008 statement by the World Health Organization, about 150,000 people are dying every year from malnutrition, diarrhea, and malaria, much of it provoked by climate change. Hardest hit are poorer countries in Africa and Southeast Asia. 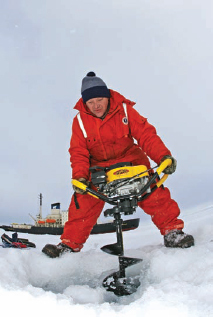 A worker drills for ice core samples in the Arctic Ocean. Such samples reveal important historical details about changes in the Earth’s atmosphere. (photo by Mike Dunn, North Carolina State Museum of Natural Sciences, courtesy NOAA).